1. The “Festas de Lisboa'19 Sardine Contest” is an initiative run by Empresa de Gestão de Equipamentos e Animação Cultural, E.M., S.A, hereafter referred to as EGEAC. Open to everyone, it aims to encourage people to produce sardine designs to be used in the Festas de Lisboa’19 publicity campaigns. 2. A contest called “Turma da Sardinha’19” (Sardine Class´19) will run alongside the “Festas de Lisboa’19 Sardine Contest” for the first time this year, in order to boost participation amongst Primary School pupils. This contest also involves the creation of sardine designs, which will then be used in the Festas de Lisboa’19 publicity campaign. 3. Ownership of the copyright of winning sardine designs belongs to EGEAC, in accordance with the provisions set out in article 14, paragraph 1 of the Code for Copyright and Related Rights. As such, EGEAC will hold the rights over them as provided for in articles 67, 68 and 159 of the abovementioned Code, namely the right to: reproduce, distribute and publically communicate the designs, including the right to disseminate and publish them in the press or otherwise display them in public; to distribute them or disseminate them by any means of sign, sound or image reproduction; to adapt them to any physical structure; to make any modifications to them; to use them within other pieces of work; and to reproduce them, directly or indirectly, temporarily or permanently, by any means and in any form, as a whole or in part. 4. The foregoing provision (paragraph 3) includes any type of use for non-commercial purposes, with their commercial use being the subject of a specific and separate contract. 5. The attribution of copyright ownership for winning sardine designs to EGEAC is definitive and not time limited as far as non-commercial use is concerned, with commercial use being the subject of a specific agreement to be defined within the contract mentioned in the previous paragraph. 6. In relation to the provisions set out in article 14, paragraph 4 of the aforementioned Code, it is hereby established that the use of winning entries for the purposes described in these Regulations does not confer on the respective author(s) the right to any supplementary payments or benefits, be they financial or of any other nature, with copyright ownership belonging to EGEAC. 7. Participants give their consent for their sardine contest entry designs to be used for promotional or publicity purposes (in accordance with paragraph 2 above), such as in exhibitions or in freely-distributed publications, in accordance with the terms set out in paragraphs 1 and 2 of article 159 in the abovementioned Code. 8. 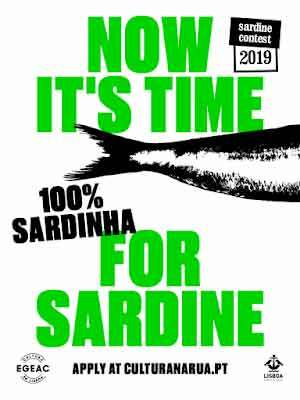 Sardine contest entry designs must make reference to their participation in the “Festas de Lisboa’19 Sardine Contest” or “Turma da Sardinha’19” whenever they are used by their designers or third parties. EGEAC must also be made aware of their use beforehand. 9. Participation in this contest by submitting an application and design entry presupposes the complete acceptance of the conditions set out in these Regulations. are legally liable for any third party claims relating to copyright, related rights and personality rights. 2. The resolution of any issues provided for in the previous paragraph, as well as any other issues, is the exclusive responsibility of EGEAC and will be communicated by EGEAC by whatever means it deems appropriate. 1. Sardine design entries must be previously unpublished and original. 2. Design entries submitted must be recognisable as sardines and not confused with other any fish; a sardine-shaped outline is available on the following website: www.culturanarua.pt. c) Video entries must be submitted on the platform as a MPEG/MPG or MOV file (no larger than 50 MB). 4. Sardine design entries may not contain any element identifying their author(s), or make reference to brands or logos, including Festas de Lisboa. 1. Applications can only be submitted at www.culturanarua.pt. 2. The application is begun with registration and the candidate accessing the site www.culturanarua.pt. 4. Each sardine design entry must be submitted using its own individual application form. ii) Applications by bodies, companies, educational institutions, IPSS (Private Social Solidarity Institutions), non-profit organisations, and other groups: the registration must be competed under the name of the group, with the person responsible for the application entering their own details in the relevant section. i) School applications: registrations on the website must be made under the name of the school, with the application representative identifying himself/herself in the appropriate section. Checking of design entries and disqualification of “Festas de Lisboa’19 Sardine Contest” design entries which do not comply with the regulations set out in this document. c) Selection of 5 (five) sardine design entries earning an honourable mention, chosen through a public vote held on social networks from the one hundred shortlisted designs, excluding the five winning sardine designs. a) The selection of 1 (one) winning design by a Jury designated by EGEAG. 1.1 5 (five) winning sardine designs will be awarded prizes. 1.2. Each winning design will be awarded a net cash prize of €2,000 (two thousand euros). 1.3. Five (five) designs will receive an honourable mention and be awarded a non-cash prize, to be decided by EGEAC. 2.1 – There will be 1 (one) winning sardine design. 2.2. The primary school with the winning design will be awarded a net cash prize of €2,000 (two thousand euros)..
2.3. In addition to this prize, Honourable Mentions may also be given should the Jury deem them justified. 3. Prizes will be awarded with a receipt complynig with Portuguese financial law. 1. All design entries accepted will be selected by a Jury to be designated by EGEAC. 2. The design entries will be selected anonymously, with no elements identifying their authors allowed. b) The design’s creativity and originality. a) The originality and creativity of the design. 4. The Jury’s selections will be made by majority decision and are not subject to appeal or complaint. 1. The contest calendar is as follows. 1.3. The winning designs will be announced by 31 May, 2019. 2. The winners of the five prizes and five honourable mentions in the “Festas de Lisboa’19 Sardine Contest” and the Turma da Sardinha’19 Contest” will be informed by email and/or telephone.